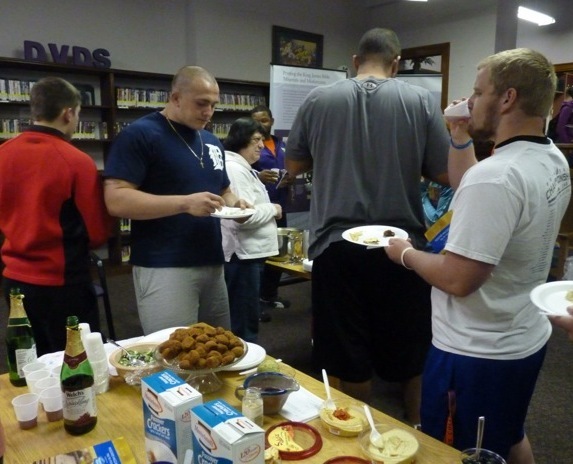 Missouri Valley College’s Murrell Memorial Library held its final event for Manifold Greatness on Tuesday, April 2. The Last Feast featured foods from the time of the Bible along with dishes from Shakespeare’s era, when the 1611 King James Bible was translated. 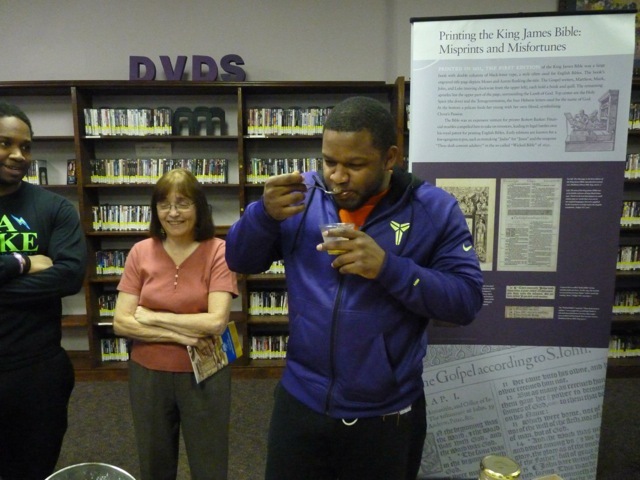 With such foods on the menu as hummus, Curacao haroset, King James biscuits, moretum, pottage from meat, Toastees, Passover crackers, figs, dates, almonds, oranges, matzo, pickled fish, cucumber salads, and bulgur and parsley salad, attendees had plenty of Passover samplings. 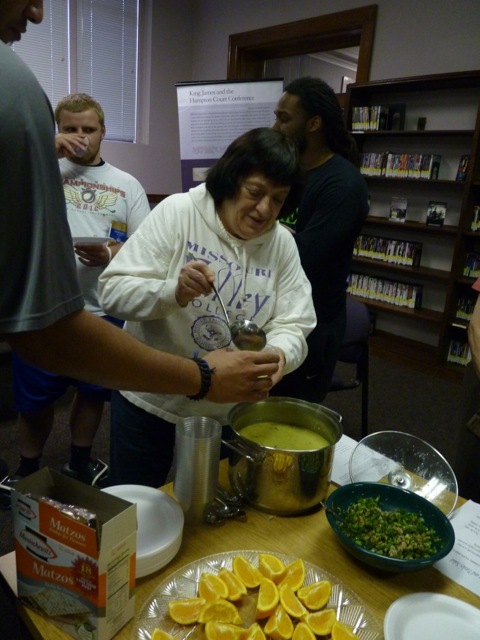 Jae Steinkuhler is the special events coordinator at Murrell Library, Missouri Valley College. 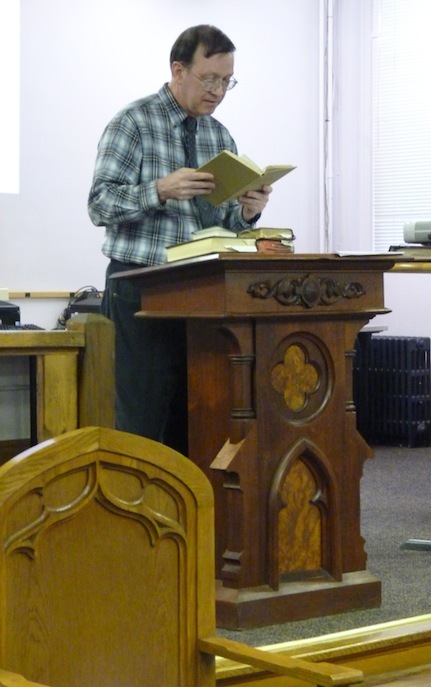 Professor David L. Roberts reads a passage from a 20th century Bible. 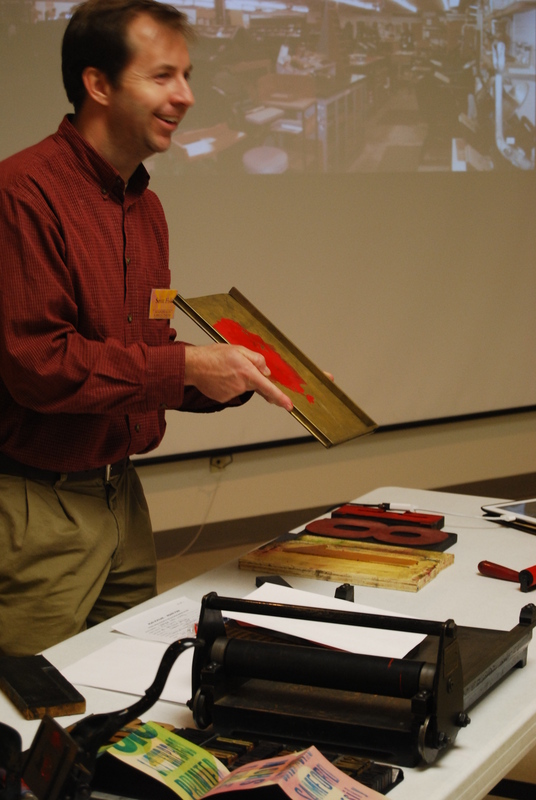 Students, faculty and community members attended the event and enjoyed not only the displays of historical Bibles, but also the displays of nativities, song books, and other church-related items. Professor Roberts presents his slideshow. In the slideshow, Professor Roberts also pointed out some key elements of the Manifold Greatness exhibit. The influence of the King James Bible in popular literature, movies and music spans from children’s programming (A Charlie Brown Christmas) to more adult music (The Byrds.) Also, the King James Bible reached new heights when the creation story was read by Apollo 8 astronauts as they rounded the moon. 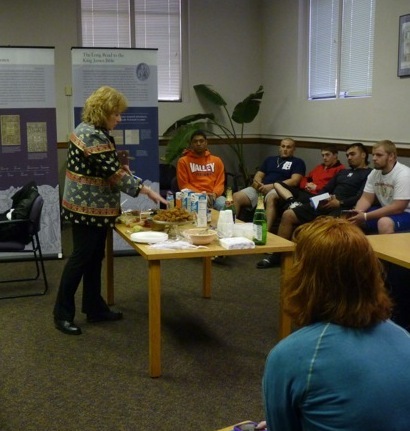 Murrell Library is looking forward to several more speakers, fun activities, and even hosting a Last Feast reception during the Manifold Greatness exhibit. 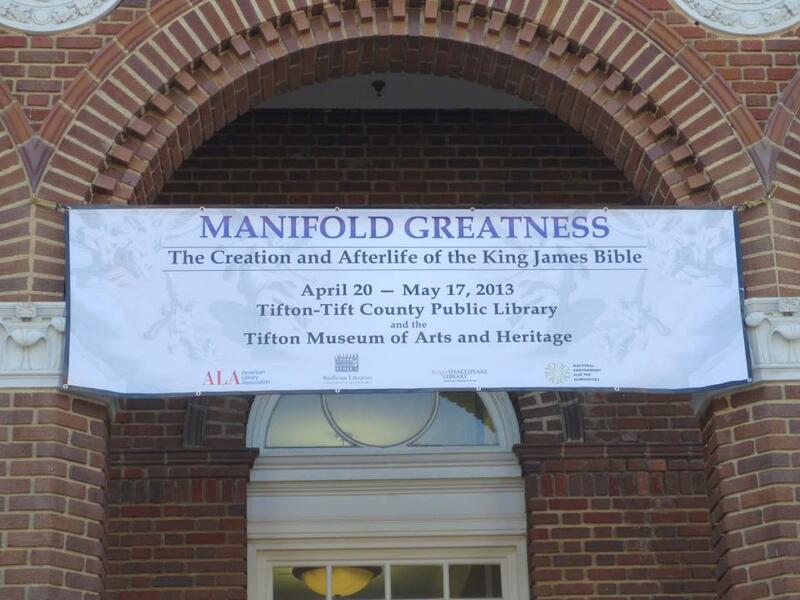 Care to explore a wide variety of King James Bible-related lectures, interviews with experts, and other events and entertainments at the Manifold Greatness exhibit sites? What better place to go than our video playlist, “MG on Tour: Experts, Events, Exhibits, and Fun,” on the Manifold Greatness YouTube channel? Using the MG on Tour playlist, you can browse through and view a wide variety of videos from many of the Manifold Greatness traveling exhibit locations. 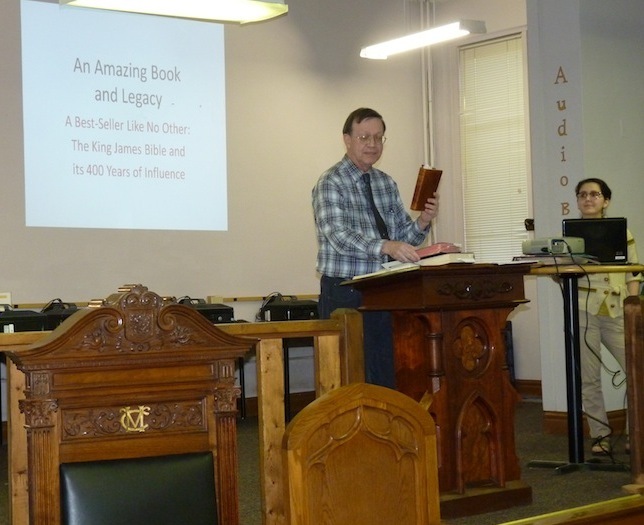 Ranging from under a minute to an hour and a half, the videos include a fascinating variety of illustrated lectures, one-on-one interviews with experts, video tours of local exhibits and rare Bibles (like the one shown here), and much more. The Manifold Greatness traveling exhibit first went on tour in September 2011. Since then, the exhibit has appeared at 33 locations around the United States, and is still going strong! The exhibit is opening this week at three new locations: Murrell Library at Missouri Valley College, Tuscaloosa Public Library in Alabama, and Cameron Village Regional Library in North Carolina. For even more Manifold Greatness videos, go to our Manifold Greatness Channel on YouTube.